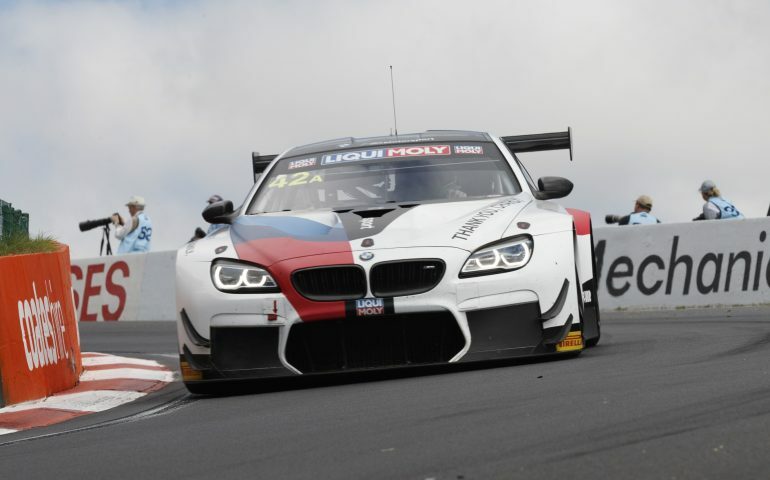 BMW’s Schnitzer entry currently leads the Bathurst 12 Hour after 100 laps and four hours of racing with Brazilian Augusto Farfus behind the wheel. The race order has shuffled around as different cars start to take their own strategies as the clock ticks down towards the halfway mark, signifying the run to the end. Though seemingly out of sequence after the #42 qualified outside of the top ten, Farfus jumped behind the wheel of the BMW M6 on lap 86, both of his team-mates already having a steer earlier in the race. Just over 100 laps in, traffic and cars out of sequence have been the story of the race thus far as management through the slower cars becomes crucial, despite some faster machines clashing with their slower counterparts. A safety car at the end of the second hour thanks to an incident between Nick Percat in a Class A Ferrari and Mathijis Bakker in the Class I MARC Focus saw the remaining 10 hours start with a bunched up pack. Luca Stolz remained out front while Steven Kane finally muscled his Bentley past the Mercedes-AMG of Maximilian Buhk for second as another safety car was deployed. As the leaders made their way up Mountain Straight, the #760 R-Motorsport Aston Martin spun on the exit of The Chase, ending up in the fence with Andreas Baenziger behind the wheel. Under the safety car, a handful of cars pitted as Andy Soucek made a mistake on pit exit, shutting down the #108 Bentley and losing time though luckily he rejoined the line behind team-mate Jules Gounon. Stolz came in with a four second lead over Christopher Haase on lap 64, climbing out of the #77 Mercedes to hand the machine over to reigning DTM champ, Gary Paffett, on debut at Bathurst. Haase took over the lead in the #2 Audi R8 ahead of Dirk Werner, driving the #912 Porsche, with the #35 Nissan of Tsugio Matsuda close behind, making it a three-manufacturer battle for the lead. Jules Gounon in seventh reset the fastest lap of the race on lap 71, chasing down the car nine seconds ahead with a 2:03.5712, still over two seconds away from the GT3 record set by Shane van Gisbergen in 2016. The #777 Bend Motorsport Park entry of Yasser Shahin earned himself a 15 second penalty after the South Australian circuit owner made contact with Jim Manolios in the #29 Trofeo Motorsport Lamborghini, causing him to go off at Murray’s Corner. Farfus took the lead just before the four hour mark as Gary Paffett pitted the #77 entry, handing the lead to the BMW. Craig Lowndes pitted the #888 Mercedes-AMG GT3 just on four hours, only 23 laps into his stint looking visibly unhappy with the car.